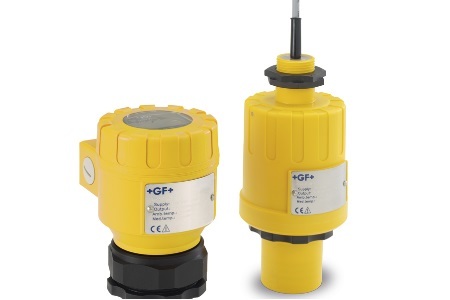 GF Piping Systems has introduced a comprehensive new level sensing instrumentation product line that includes ultrasonic level transmitters, sensors, and a variety of switches. The new product line-up was developed in response to customer demand following the proven performance of the company's existing Submersible Hydrostatic Level Sensors and Transmitters. Key highlights to the new line are the 2260 Ultrasonic Level Transmitter and the 2270 Ultrasonic Level Sensor. Together, these devices provide reliable and maintenance-free measurement and detection for nearly all liquids and types of vessels - from closed tank systems to open basins - and are suitable for use in variety of water treatment, chemical processing, and ultrapure water applications. "The new ultrasonic products offer more intelligence than other level measurement products on the market," says Dave Vollaire, Instrumentation Product Manager for GF Piping Systems. "They can differentiate between substances like condensation or agitation and the true, actual level of the medium, thereby avoiding incorrect measurements." This rugged, chemical-resistant plastic sensor is designed for high or low level alarm for a variety of different tank applications as well as pump control. These heavy-duty stainless steel sensors feature a maintenance free vibrating principle capable of handling high temperatures for level detection of liquids or granular powdered solids and are available with an explosion-proof option. Based on the conductivity principle, the 2281 Switch is designed for easy on site probe length configuration. With its two to four individual switching points integrated into one sensor, installation is fast and easy. The hermetically molded 2285 Float Switch features a double chambered float that ensures waterproof protection. The 2285 is suitable for level switching of various liquids as well as sewage in shafts, tanks and basins or cisterns. These traditional switches feature compact design and excellent chemical compatibility for economical control of liquids in tanks. "The new mid-range level sensor products really round out the instrumentation line and allow us to provide solutions in applications where we were previously limited," adds Vollaire. By introducing ultrasonic level sensing capabilities into our offering, we can now truly be a one source solution for customers' liquid control systems."